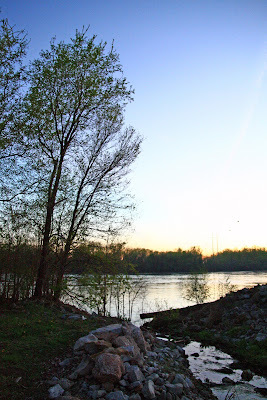 This is the third in a series of posts on my last meals in the Kansas City area. To start from the beginning of the series, click here. For a completely different view of St. Joseph, MO, I'd like to introduce you to the casually classy Foster's Martini and Wine Bar in the downtown area. This is undoubtedly my favorite place in St. Joe. The bar has a bit of a contemporary artsy ambiance to it, what with the bright blue walls decorated with busy art displays. The seating feels comfortable and the at night the lighting is dim. It is elegant, yet down-to-earth at the same time. 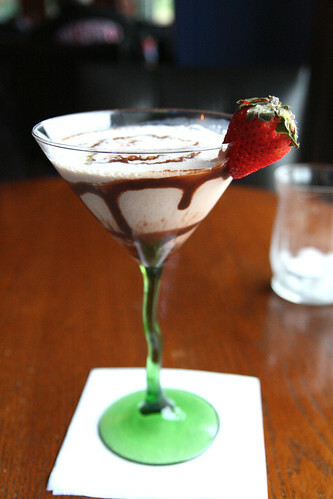 Vodka, Irish Creme, and Creme de Cocoa! In the past I've also had the Pink Lady and the Love Potion No. 9, both of which I liked. R. had gotten the new Strawberry Fields (though without the alcohol) based on our waitress' suggestion, and it was highly refreshing. Judging by their expansion plans, I'm guessing Foster's is doing quite well. It is great to see a place like this thrive in little St. Joe. This is the second in a series of posts on my last meals in the Kansas City area. To start from the beginning of the series, click here. 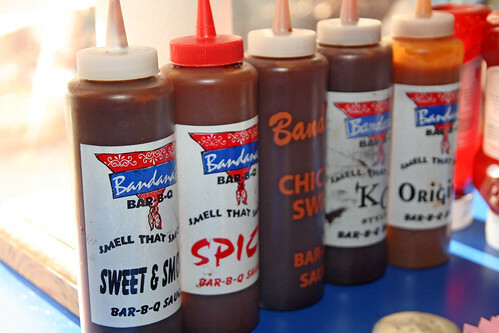 Bandana's sauces: Sweet & Smoky, Spicy, Chicaco Sweet, KC Style, and Original. The Sweet & Smoky sauce is a St. Louis-style sauce that's basically a blend of the sweetness and tanginess of the Kansas City-style, the spiciness of the Texas-style, and the mustardy goodness of the Southeastern-style. Some of the main ingredients in Bandana's Sweet & Smoky sauce are brown sugar, vinegar, tomato paste, mustard, and smoke flavor. I usually get the combo platter at Bandana's with two meats, two sides, and two slices of garlic bread. For my meats I usually get chicken (dark meat) and ribs, though this time around I went for the beef instead of the ribs. I should have gotten the ribs after all as the ribs are far superior to the beef, in my humble opinion, but the chicken was excellent as ever. In any case, they smoke all their chicken, beef, ribs, and pork in a pit of hardwood for several hours, which gives the meat a smoky flavor but it's not too overwhelming. For one of the sides I always upgrade to the fried corn on the cob, served with dripping butter. 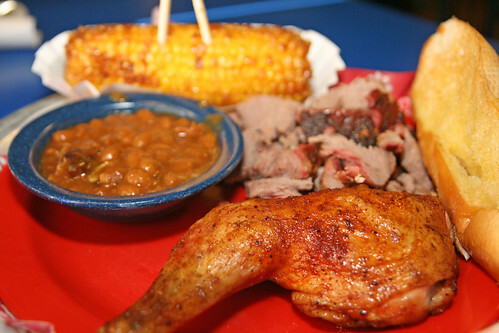 It's bad, I know, but you don't exactly go to a BBQ restaurant expecting to eat healthy. ;) I'd have to say though, that the corn used to be better but lately they've been overcooking it. For the other side item, I got the BBQ beans. I claim no expertise on BBQ, and I certainly acknowledge that much of it depends on what style of BBQ and how much smokiness one prefers. I would also admit that Bandana's isn't perfect in every way, but I do prefer it over some of the other popular BBQ chains such as Gates in Kansas City or the much larger Famous Dave's. Luckily, it is possible to order Bandana's sauces via their website, so at least there is always an option for a taste of Bandana's at home. BRGR doesn't take reservations, but the wait wasn't too bad on this particularly Friday night. The fact that they've just opened the upstairs patio probably helped. The atmosphere is upscale and contemporary; with several large TVs broadcasting sports games lining the main dining room, BRGR is a bit like sports bar meets fine dining. I love how tech-savvy they are, too: When you put your name down they take your cell phone number and text you when your table is ready. My Shroomz burger with my sangria. Nicole did order the Salty Caramel spiked shake as a dessert and liked it a lot. 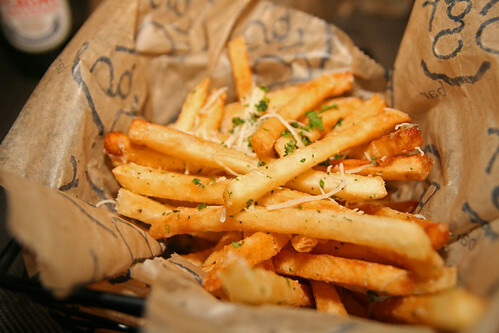 A side of fries, with Parmesan cheese and herbs. The Average Joe is basically your standard burger, with tomato, onion, and lettuce, and you have the option of adding cheese and bacon as well, as Chris did here. 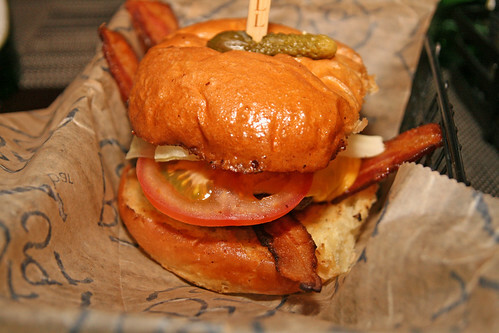 I have already been asked which is better, Burgh'ers or BRGR. I think that's a difficult question to answer because it's a bit like comparing apples and oranges. If you're looking for a more casual, down-to-earth atmosphere or are specifically interested in grass-fed beef, then you should go to Burgh'ers. On the other hand, if you are looking for something more upscale, in a more hoppin' neighborhood, and grass-fed beef isn't a must, then BRGR is your choice. 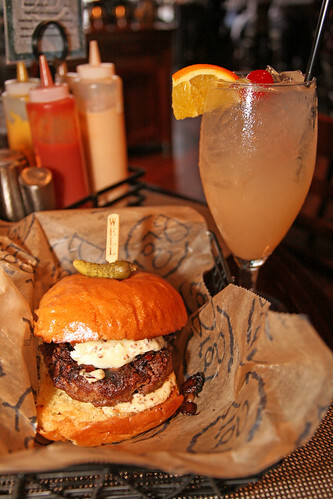 If you're just looking for a good burger, you can't go wrong with either. Keep in mind, too, that Burgh'ers and BRGR are a good 35 miles apart, so maybe the location will end up being the major factor. A comparable meal will likely cost you a little more at BRGR because you have to order sides separately and the valet parking will cost you a few bucks as well. 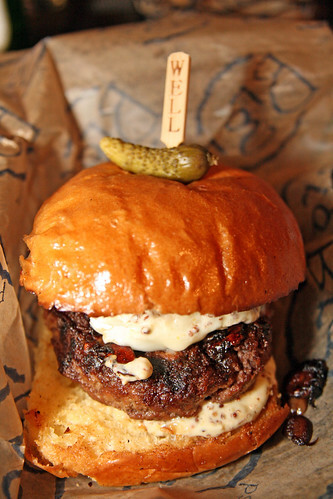 A more relevant comparison may be BRGR versus Burgatory in Aspinwall, but I have yet to visit the latter, though I'm hoping that it'll be the destination of my next burger adventure. Just a quick post and a little bit belated, but I made this a couple of weeks ago as part of my "cleanse" diet. I had mentioned in a previous post that sometimes I just feel like my body needs a healthy, homemade meal to balance out all the high-calorie meals I consume when I eat out. At 237 calories per serving, this Singapore Mai Fun ("mai fun" is Chinese for rice noodles) recipe definitely fits the bill. I'm also pretty busy this time of year (well, really, most times of the year...), so meals I make at home, like this one, tend towards the easy but tasty. This Singapore Mai Fun is a little bit spicy and really delicious. Personally, I think it's better than take-out, and definitely healthier! Last Wednesday a small group of us had the pleasure to attend a special preview of Bricolage's Hunter Gatherers. Before the show, we met up for dinner at NOLA On the Square, a New Orleans-style restaurant in Market Square that has been on my wish list since the day it opened in mid-March. The back dining section at NOLA. Our table at the corner. 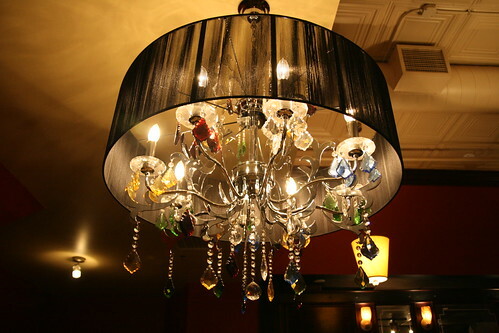 Dining under this beautiful chandelier. But what about the food? Against my better judgment, I ordered both a soup and an entree. 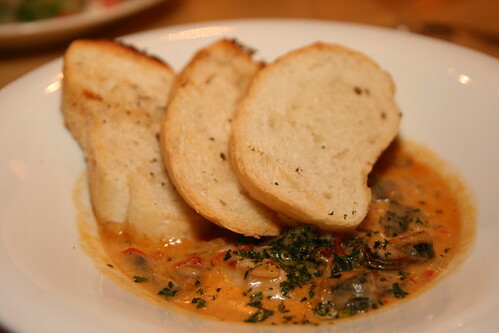 ;) The Oyster Stew is a bowl of creamy goodness with oysters, mussels, and artichoke, and there is definitely no skimping on any of the main ingredients. I highly recommend this one. For the entree I ordered the Creole Tartiflette, which is a wood-fired casserole with lots of potatoes, camembert cheese, artichoke, smoked bacon, in a Creole mustard cream. In hindsight, I probably should not have paired a creamy stew with a creamy casserole. By the time I got to the Creole Tartiflette, I was pretty full from the stew and a little bit "creamed out." Don't get me wrong, I didn't dislike the dish, but I had trouble really savoring something so hearty and rich at that point. All in all, I had a great first visit to NOLA. Olga had made a few delicious-sounding drink recommendations earlier in the night that I had declined because we were headed for a Happy Half Hour right after dinner and before the show. I promised Olga I would be back for drinks next time. Keeping my promise, I was back a few night later. I was out of food at home and didn't have time to cook, and not only did I feel like having a drink, I was also really hungry for a good jambalaya ever since regretting not getting it on my first visit, especially because a friend of mine did and thought it was fantastic. So I decided to make an impulsive repeat visit before the week's end. 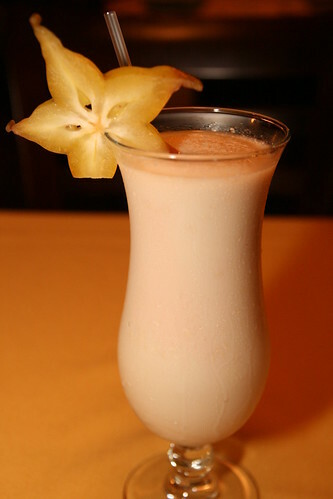 The Dirty Banana Pina Colada is thick, flavorful, and tastes as good as it sounds. It definitely gave me a buzz, though I'm not sure if it was because they put a lot of alcohol in it (which would be great!) or because the jambalaya was the first solid food I had had all day. Or both. Once again, I had Olga as my server, and she was, once again, very helpful. 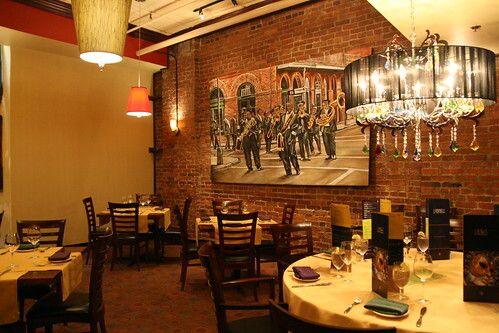 Overall I think NOLA has a great combination of atmosphere, food, and service and is a great addition to Market Square. Flag this as one I'll come back to for sure! Last weekend I had a sudden burger craving (probably fueled by China Millman's Post-Gazette article featuring the new burger bars in town). I wasn't craving just any burger though - I wanted a big, fat, juicy beef burger. You see, I hadn't had a beef burger since my first (and last) visit to Five Guys in DC in July 2009. Don't get me wrong, I enjoyed the burger, but quite literally while my body was still digesting that meal, I went to see the Oscar-nominated documentary Food, Inc. and my life hasn't been the same since. Without going into too much of the gory detail, I pretty much swore off ground beef right then and there unless I was sure that the restaurant ground their own beef or that the beef was grass-fed instead of grain-fed. And just like that, no more beef burgers for me. So you can imagine my excitement a little while ago when I found out about the new burger joint, Burgh'ers, in Harmony through a news article about it having been deemed the best burger in Pittsburgh. 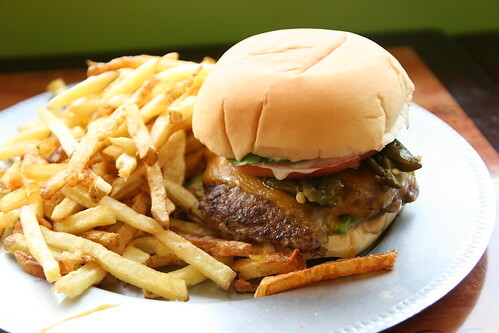 I was excited because Burgh'ers uses ingredients from local farms and their beef is local, organic, and grass-fed. In other words: ground beef I CAN eat! So Burgh'ers came to mind immediately when the I felt like my tummy could use a long-overdue beef burger. And this thing was hot alright! But more importantly, tasty. What an interesting combination of flavors! Everything was cooked just right. The patty was juicy but not too greasy, the buns were soft and warm, and even the fries were great. I cleaned up the entire plate, and if you know how petite I am, you'd know this is quite a lot of food for me. But I ate it all because it was so good! The restaurant was pretty busy when I got there, and it was absolutely packed by the time my burger was served. I was actually hoping to take advantage of Burgh'er's free wifi and get some work done, but decided against it because I didn't want to take up a seat if I wasn't eating. As I was close to being done with my meal, the little boy sitting at the table behind me came up and asked if I was a reporter, which I thought was so cute. I got into a conversation with the nice parents and turns out they decided to try Burgh'ers after reading China Millman's article (and Mr. and Mrs. Nice Parents, if you're reading this: Hello!). I didn't stick around long enough to find out if they liked their burgers, but I'm really glad that this little local joint located way beyond the North Hills is getting so much attention. It is also BYOB, which is another plus. I had thought that my visit to Burgh'ers would satisfy my burger craving, but if anything, it seemed to have intensified it! If they had been open the following day on Sunday, I just might have made a repeat trip up there. I guess it was probably best for my waistline that they weren't open! :) I definitely see more burgers/Burgh'ers in my near future, and I'm very happy to have found another restaurant in town that is committed to supporting local agriculture. Last Sunday during my out-of-town friends' visit, they were interested in taking a walk around downtown Pittsburgh and doing brunch at a restaurant that wouldn't mind having their 19-month-old boy run around. Being fairly new to town and not having gone out for Sunday brunch at all, I wasn't really sure which restaurant would fit the bill, so naturally I took to the Twitter world for help. The only person who responded to my inquiry was none other than Derek Stevens, the Executive Chef at Eleven, who was nice to reassure me that Eleven wouldn't have a problem with my friends' kid. (Thank you, Chef Stevens!) Eleven had actually been on my restaurant wish list for a while, so I was excited to hear that they would be open for brunch on Sunday. Nested right in between the Central Business District and the heart of the Strip District, the location also made it the perfect choice for us on this particular day. Eleven is conveniently located right across from the large History Center parking lot, and they have their own valet parking service as well. I had to call Eleven on our way there to apologize for being late for our reservation (having a 19-month-old around will do that to ya!) and they were so very nice and accommodating about it. Once we arrived, the hostess offered to check our coats, and we were promptly seated at one of the upstairs booths. They also quickly brought us a high chair that I had requested at the time of the reservation. 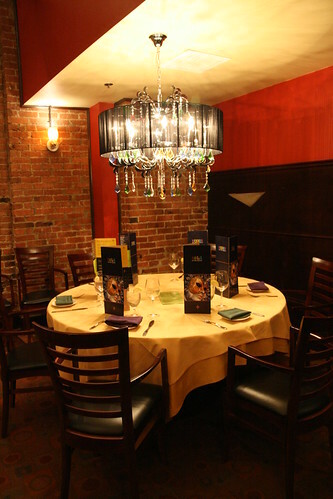 The restaurant is fairly large with two floors and the decor is quite contemporary and upscale. As you enter the restaurant on the lower level, you can also see the open kitchen in full view to the right. Overall, Eleven has a very nice atmosphere. The Sunday Brunch menu has several options for appetizers ($9), entrees ($15), and beverages (alcoholic $8-9; non-alcoholic $3.5). 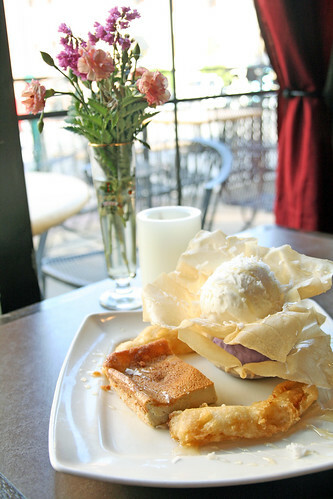 There is also an option to take the prix fixe for $25 which includes an appetizer, entree, and a drink. All three of us adults decided to go with that option. 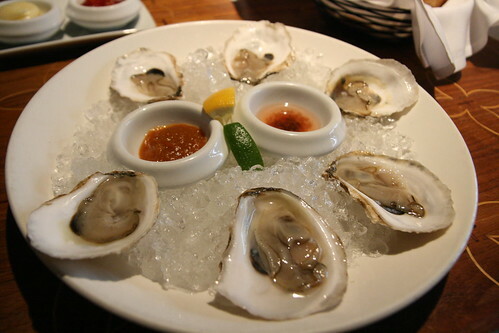 For my appetizer, I picked the oysters, which came with two sauces. The one on the left is the Eleven hot sauce made with jalapeno peppers, and the one on the right is a mignonette made with red wine vinegar, pink peppercorn, and various seasonings. Both were delicious. For the entree I got the Crab Cake sandwhich, which comes with pickles, tomato, and a fennel slaw, with a side of fries. 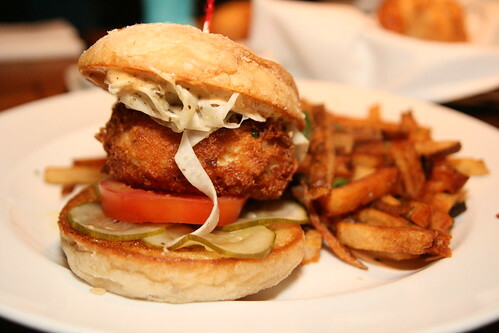 (As of this writing, they have changed the recipe for their crab cake sandwich...that was fast!) This was actually the first crab cake I've had in Pittsburgh and a bit of a risky choice. I just moved here from Maryland - the land of crab cakes - so I had been skeptical of the quality of crab cakes anywhere else. But now that I no long live there, I needed to give crab cakes in Pittsburgh a chance lest I'll never eat crab cakes again! So I decided to go for it. I thought the sandwich was quite good, and the crab cake itself was full of crab meat rather than filler (my greatest fear with crab cakes). I personally would have preferred the crab meat to be lumpier, but that's probably because I've been so thoroughly spoiled by the amazing crab cakes at G&M Restaurant & Lounge in Maryland. Still, I think Eleven's version was very good. 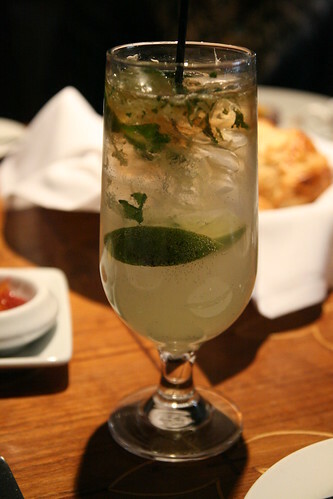 For my beverage, I had the Vanilla Mojito, described as "Cruzan rum, mint, lime, vanilla agave, and Myers float." It was a good complement to the rest of my meal. Instead, the wait staff packed up some fresh pastries for my friends that would be ready for pick up at the coat check on our way out. Overall, the service at Eleven was absolutely top-notch! 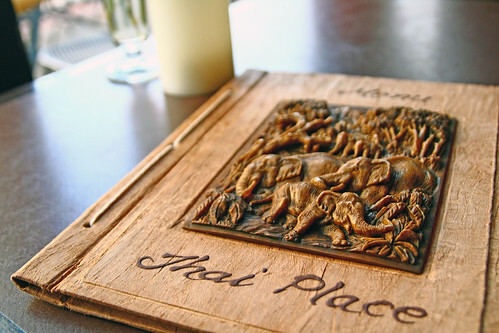 Great food, great service, great atmosphere. It is no wonder why so many people have raved about this place. I am so glad I finally got to try Eleven! My good friend from graduate school, along with her husband and little boy, came to visit me in Pittsburgh last weekend on their way from Cincinnati to New York. They had planned to arrive around dinner time on Saturday, and because their kid was nursing a cold, they wanted a low-key evening. So I decided to flex my cooking muscles and prepare dinner for everyone. Having learned from the minor disaster that was Sunday Brunch a couple of weeks ago, I decided I would make something I've successfully cooked before. I didn't have time to carefully look through my two very full binders of recipes, so I went with one of my all-time favorites: Palace Café's Shrimp Tchefuncte. the butter”). As you add the last of the butter, remove your pan from heat; continue to stir. Add salt and pepper to taste. Strain through a fine strainer or china cap. Cover and set aside. Wash (in cold water) and season shrimp with salt and pepper (we use our house Creole seasoning in the restaurant). Melt butter in a medium sauté pan, then add shrimp, green onions and mushrooms. Cook over medium heat for 3-4 minutes, stirring constantly until shrimp turn pink. When ready to serve, add meunière sauce and heat. Pack rice in a cup (a shallow coffee cup works well). Invert the cup over the rim of your plate and lift slowly. 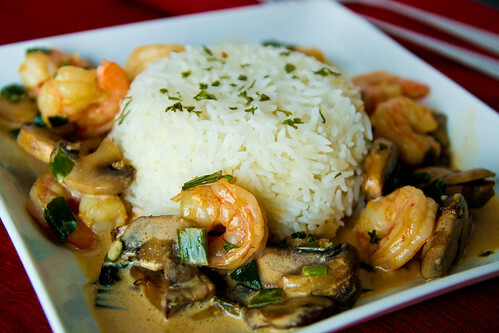 Spoon Shrimp Tchefuncte around ¾ of the rice. The Tchefuncte River, located north of New Orleans was named after an Indian tribe that once inhabited the area. It was actually pretty close to how I had made it based on other recipes I had found online. I had made this a number of times now over the past two years, with generally successful results. When I make this at home now, I do make one important modification to the original recipe: As much as I think the real thing would be out-of-this-world delicious, I just can't bear to put two POUNDS of butter - that's eight sticks!! - into anything I make, particularly because I'm the one stuck with all the leftovers and that's a whole lotta butter for one person. (There's still a part of me that wonders if the butter amount is just a typo! Actually, I kind of hope so! - UPDATE: Palace Café has confirmed the amount is NOT a typo. Yowza! Now I know why it tastes so good!) So when I make this at home, I reduce the amount of butter in the sauce significantly, to about 2-4 tbsp (to taste), which I'm sure affects the flavor, but it's still quite good and I'm happy with it. As I'm stirring the sauce, I try not to press too hard on the lemons for the juice. I have learned the hard way that the sauce can quickly turn bitter if it is too lemony (though my using less butter could have thrown off the lemon-butter balance, causing the bitterness). I adjust the proportions of the other ingredients as I go along to make sure all the flavors are well balanced. The meunière sauce is what makes the dish, so it's important to get it right. On Palace Café's Facebook page is a professional photo of the real deal, which obviously looks fantastic and much more appetizing than my homemade version. ;) Their sauce is darker, which is curious, and the rice is different because I actually just used regular long-grain rice, which I readily had at home, rather than popcorn rice (a.k.a. American basmati rice or della rice). For those of you loyal readers who have been following my food adventures since my first food blog, you may find this story familiar, as I had previously written a post about my experience at - or obsession with, depending on how you look at it - the Palace Café in New Orleans. I have since continued to refine my skills in replicating the Shrimp Tchefuncte at home, and thought it would be appropriate to redo my blog post on the subject. This blog is actually broken up into two parts. In Part 1, I describe my experience at Palace Café, and in Part 2, I explain how I made it at home, modeling after several recipes I found online and the real thing from Palace Café. In June 2002, I was in New Orleans for a professional conference, which was held at the Sheraton on Canal Street, just outside the French Quarter. One day I decided to venture out on my own for lunch, and I decided that, despite my measly grad student budget, I was going to have real New Orleans food no matter the cost. (You can see I was already a foodie in the making!) I crossed Canal Street whereupon I found myself standing in front of Palace Café. I took a look at the menu outside and thought, "Well, it's a bit pricey, but the menu looks good and this seems to be a cute place. I'll just order something small." So into the restaurant I went. As soon as I entered the premise, I knew I was in trouble. First, I was stunned by the hospitality. Turns out the restaurant was much more upscale than I had thought. I was greeted by a sharply dressed hostess, and had a total of three servers - all wearing bowties - waiting on little petite me. Pretty soon I also noticed a string trio (or was it a quartet? can't remember now) offering private musical treats from table to table. I looked at the menu and decided it would make me look real lame to "just order something small," so I went with the Shrimp Tchefuncte, described as "sautéed Louisiana shrimp with Creole meuniere, green onions, roasted mushrooms, and popcorn rice." It sure sounded delicious! Meanwhile, the string trio (or quartet) has made its way to my table, and asked if I had a request. I didn't. I was actually a bit embarrassed and felt out of place. So I just asked them to play whatever they wanted. 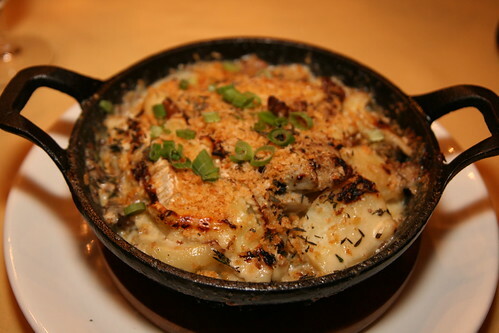 But let's cut to the chase and talk about the food: Shrimp Tchefuncte. I took one bite and OH. MY. GAWD. It was absolutely the best thing I had ever tasted. 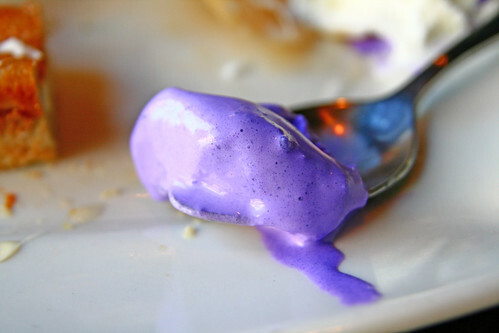 (It's been nine years now and it is still one of the best things I've ever tasted.) The creamy sauce was absolutely brilliant. I was instantly in love. Anyway, a couple of days later I left the Big Easy and headed home. 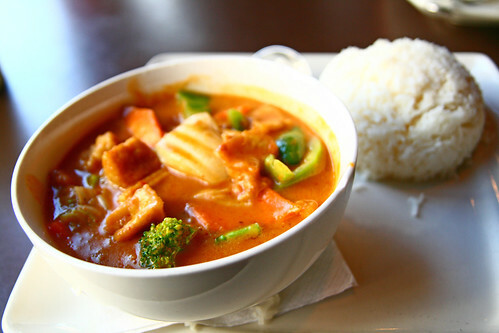 I might have forgotten what I learned at that conference, but I never forgot Palace Café and their Shrimp Tchefuncte. 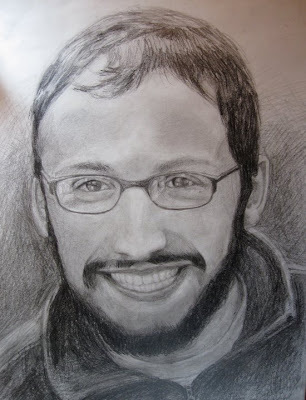 As luck would have it, I had the opportunity to attend another conference in New Orleans in January of 2005. (Yay for meeting planners!) And as if the food gods heard the prayers from my stomach, the conference was once again held at the Sheraton on Canal Street! (Double yay!!) I stuffed my credit card in my pocket made my way over to Palace Café as soon as I got the chance. And needless to say, I ordered the Shrimp Tchefuncte. It tasted just as amazing as I remembered it. This time, I also got the crabmeat cheesecake (like, how could you not??) and a dessert. I was out $40 by the end of the lunch hour, but that's a small price to pay for absolute bliss in the tummy. As I left the cafe, I told the staff about my story, how I specifically came back to their restaurant after three and a half years just to enjoy their Shrimp Tchefuncte. Then, to my absolute delight and surprise, they offered me the recipe!! I could not believe how nice they were about it, and even though I didn't cook back then and knew I didn't have the skill to pull off such a heavenly dish, I happily accepted their gift, brought it home with me, and stuffed it in a manila folder along with all the poster handouts I picked up during the conference. 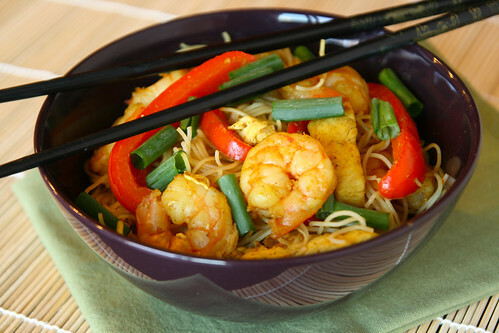 Click here for Part 2: The Recipe and see my attempt at making Palace Café's Shrimp Tchefuncte! Somewhat hidden along Bingham Street, a block north of the hustle and bustle of Carson Street in South Side, is a little restaurant known as Gypsy Café, the venue of last week's dining out adventure. Gypsy Café has a small but pretty creative menu consisting of an eclectic mix of European dishes, mostly from Eastern Europe. (I suspect their menu changes often, just like their hours.) Despite the limited selection, which included several a la carte options as well as a three-course prix fixe menu, I had a difficult time deciding on what to order as everything sounded delicious! I was tempted by the salmon, but ended up going with the Shortrib and Oxtail Borscht, a traditionally Ukrainian dish, for a true Eastern European taste. And I'd venture to say that this was one of the best dishes I've had in Pittsburgh so far! The Shortrib and Oxtail Borscht was a very flavorful combination of beef, roasted beets, cabbages, and tomatoes, in a delightful sauce that achieves a nice balance between sweetness and tanginess. The shortrib was a tiny bit on the chewy side, but the oxtail was perfectly tender. The dish was topped with sour cream which adds another element of tanginess to the soup. 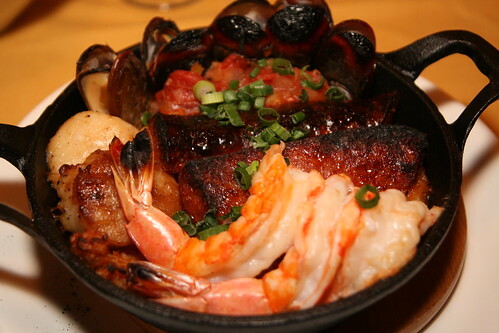 I always appreciate a dish with a full and complex flavor that just works. 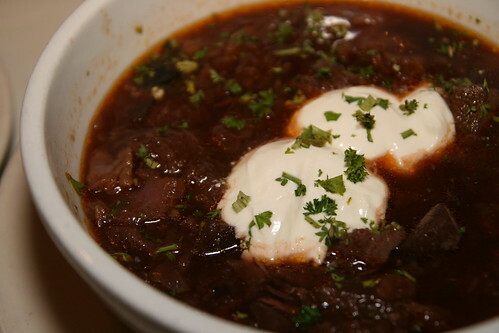 As weird as this may sound, I also find myself having a particularly vivid taste memory trace of this borscht - that is, I find the flavor of the borscht to be very memorable (in a good way), which I think speaks to its savoriness. Everyone else I was with was impressed with their food, and the portions were huge as well. This is undoubtedly a place for a repeat visit, perhaps on a night that features live music!